Our optical pH sensors are optimized for culture media and physiological solutions and can be applied from microliter to production scale. You can choose from various pH sensor designs - or disposables with integrated sensors – to get a fiber optic pH probe that really fits your requirements. 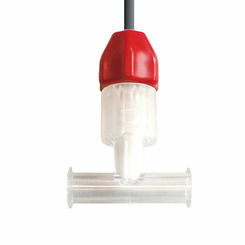 If you cannot find an optical pH sensor suitable for your application in our product range, just contact us! Sensor designs can be adjusted for certain applications and we offer sensor integration in customized housings. 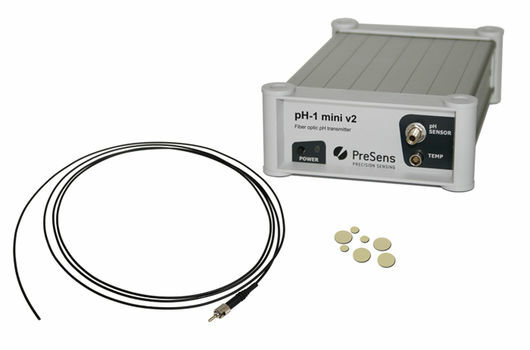 PreSens fiber optic pH sensors have a measurement range from 5.5 to 8.5 pH, which is perfectly suited for culture monitoring and physiological applications. Optical pH sensor foils for 2-dimensional visualization of pH distributions are available for low pH (2.5 – 4.5) and medium pH (5.5 – 7.5) range. All our optical pH sensors are pre-calibrated and can additionally be delivered either beta-irradiated or untreated, according to your requirements. The measurement principle of PreSens fiber optic pH sensors is based on the patented Dual Lifetime Referenced (DLR) method, which enables internally referenced measurements. A combination of different fluorescent dyes detects intensity changes in the time domain. This principle is essential for pre-calibrated and parallelized measurements, as identical calibration data can be used for a large number of pH sensors. 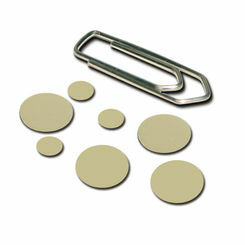 Due to the optical measurement principle these sensors are also independent from electromagnetic fields. 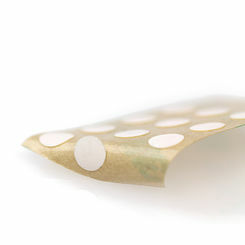 Contactless optical measurements with pH sensor spots or flow-through cells have many advantages compared to conventional pH monitoring techniques. They are ideally suited for culture monitoring applications as no sampling is necessary – reducing the contamination risk to a minimum. 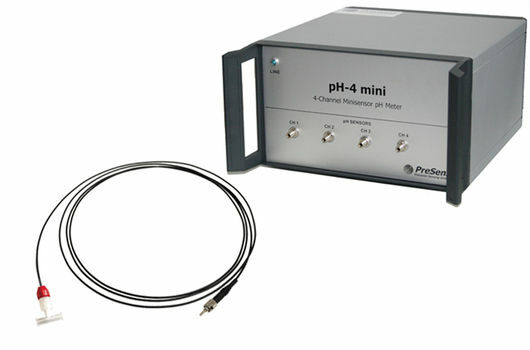 pH development can be followed online, which enables optimal parameter control. With self-adhesive pH sensor spots the customer can easily turn most transparent plastic or glass vessels into a bioreactor. However, the applicability of optical pH sensors is not limited to culture monitoring applications and they find use in many other research fields like pH monitoring in micro-respiration chambers or sediment pore water. For minimally invasive high resolution measurements PreSens offers several fiber optic pH microsensor versions, from implantable pH microsensor for integration in customized housings or implantation in tissue, over needle-type microsensors that can be pierced through material, to robust profiling microsensors for insertion in semi-solid samples. 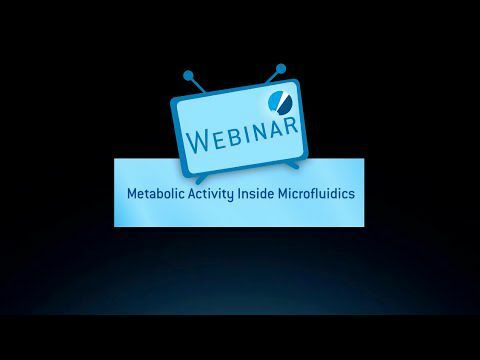 These sensors can measure in smallest volumes and combined with the PreSens micromanipulators most exact localization of the sensor tip inside the sample, or profiling can easily be realized. From monitoring pH levels inside engineered tissue, implantation in small animals, measurements in micro-volumes of liquids, to automated profiling in sediments or biofilms, our optical pH microsensors can be applied in most different research fields. 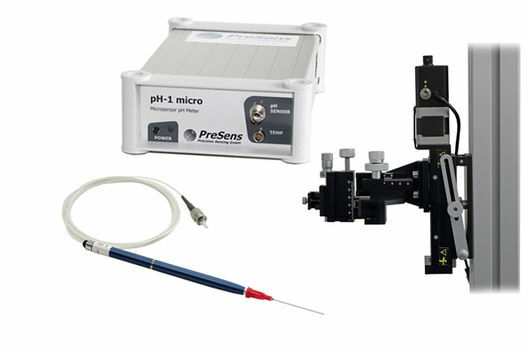 A further option for optical pH measurements is our pH imaging system. 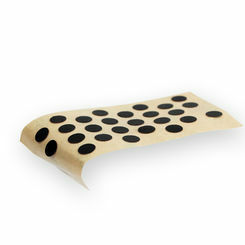 An optical pH sensor foil is placed on the sample surface or a cross section and pH distributions and changes over time can be assessed 2-dimensionally. pH imaging can give whole new insights, as thousands of measurement points can be recorded in just one image. Look through our different optical pH sensors and find the solution for your application!